IT USED TO be that if you installed security software on your computer, you were protected. Not any more, as hackers aren’t just after your computer, but any device you have connected to the internet, from smart TVs to security cameras. Attacks on smart home devices are rather worrying and bound to increase. Last year, we saw the full threat when the Mirai botnet infected thousands of smart home devices and was used in a distributed denial of service (DDoS) attack. That is only the start of the problems, however, and an infected smart home device could open up your home network to further attacks and issues. Unfortunately, traditional routers aren’t geared up to offer any protection from these kinds of attacks, and can’t monitor your internet traffic for problems. Step forward something different, the F-Secure Sense. Sense is a combination of two products. First, there’s the security-hardened router, which gives protection to all your devices. It’s a diamond-shaped glossy plastic box, and it looks fantastic. We love the clock that shines through the front. This can be dimmed or turned off, in case you have the router in a bedroom or other room where the bright lights would be a distraction. Second, there’s the Sense application, which uses F-Secure’s anti-virus engine and protects your Android and Windows devices (there’s an iOS app for setup only, while Macs currently aren’t supported). It’s a powerful tool, protecting against 100% of threats in the most recent AV Test report. in the price of the router. This nets you all of the protection features, including software licences for 25 Windows devices and unlimited Android devices. 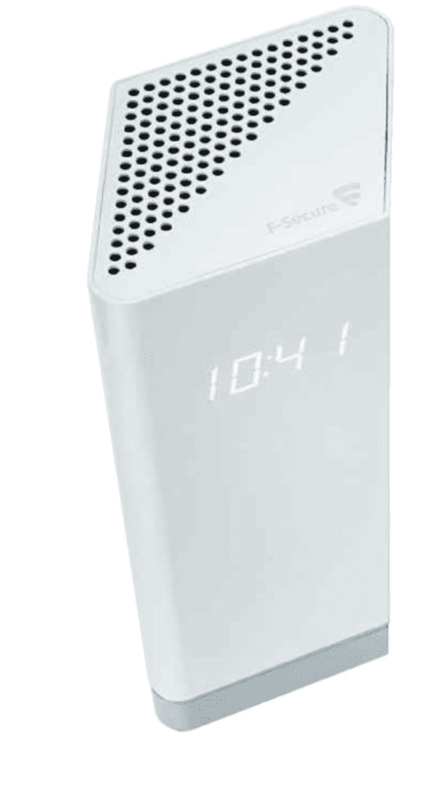 The F-Secure Sense is designed to be plugged into your existing wireless router. It will not work with a modem, such as the BT Openreach model, which is a real shame. Routers use a system called Network Address Translation (NAT), which lets you run many devices, each with their own internal IP address, through your internet’s single IP address. By making you connect the Sense router to your existing router, you end up with a case of double-NAT (once on your existing router, and once on the Sense). This can make things such as port forwarding much harder, as you have to configure the settings on both routers. In some situations, this will not work at all, particularly for games and TV services. In fact, our BT YouView service wouldn’t work with streamed channels such as BT Sport. The only way around the issue is to plug certain devices into your existing router. We’d like to see F-Secure update the Sense router, giving it a PPoE option so that it can connect to most UK broadband providers via a modem. A second slight disappointment is that the Sense has just three Gigabit Ethernet ports. Having one port fewer than most routers could be a problem: we had to plug in an additional switch to connect all our devices. Once you’ve connected the Sense to your existing router, setup is managed through the Sense app for Android or iOS. Only one smartphone can control the router at a time, so make sure you use your primary phone. If you want to change phones later, you will have to reset the router and start again. If possible, we suggest sing iOS, as the Android app can’t currently configure port forwarding, which is a strange omission; support is coming soon. As this is a secure router, the Sense configuration is a little different to that of most regular routers. First, you have to pair your controlling smartphone with the router. This is done via Bluetooth, and requires you to enter the four-digit code displayed on the router into your app. After that, you’re taken through a quick wizard to configure your wireless network name and password. Secure defaults are suggested, but we recommend disabling Wi-Fi on your old router and then configuring the Sense to use the same Wi-Fi name as your old router, so all your existing devices connect. One minor issue is that the Sense’s DHCP server uses a new IP address range (192.168.71.30 to 192.168.71.249). If you’ve got devices that use static IP addresses, you have two options. First, you can change their address to match the new range. Second, you can change your old router to use a different IP address range (you’ll have a conflict otherwise), and reconfigure the Sense router to use your old DHCP IP address range. Either way, it’s a bit of a faff. Finally, if you keep the Sense’s default settings, you may find that some devices don’t work. This is most likely because they’ve held on to their old IP addresses. Rebooting them should fix the problem. Security protection is very easy to manage, using toggle switches in the app. By default, the router is set to protect all devices, with browsing protection turned on. In this mode, Sense actively blocks malicious websites on all devices, reducing the risk of phishing attacks or drive-by malware installations. It works well, too, blocking all of our attempts to visit malicious sites. This isn’t true web filtering, though, so you’ll need parental controls if you want to filter what your children can see. In its default mode, Sense builds up a profile of your smart devices, too. By monitoring the patterns of traffic and where the devices are talking to, Sense can see what’s normal. Should your devices suddenly start sending loads of data, or communicating with known command servers (the parts that run botnets), Sense can automatically warn you and block internet access to that device. Additionally, tracking protection can be activated, which will prevent websites and criminals tracking you through the web. We recommend turning this on. At the minimum, it will prevent so many tracking adverts from following you around, making the web nicer to browse. 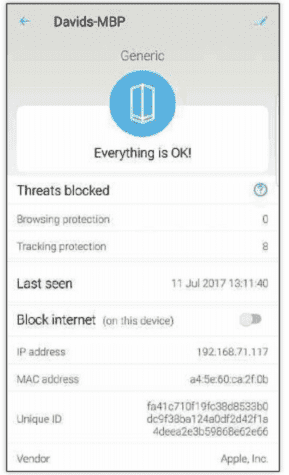 From the app’s main screen you can see your current network status, including whether any threats have been blocked. You can tap the threat count to find out specifically what has been blocked. Go to the Devices section, and you can see a list of connected machines. Where possible, Sense pulls the device’s name or manufacturer to help you identify what each product is. You can also override each device, rename it and choose a more meaningful icon. If Sense is struggling to pull any meaningful information (we had one device that identified as being from a Chinese manufacturer), you may want to go round your home and turn everything off. Then, turn on each device one at a time, so you can see what’s connecting to your network and label it accordingly. Select any device in the list, and you can choose to block the internet, which is a handy way to get the kids’ attention when it’s dinner time. It’s a shame that schedules can’t be configured at the moment, and we hope that this is part of the advanced parental controls update. Finally, the device status page shows you how many threats have been blocked, and if the device is OK or potentially compromised. There’s no guest network option, although this feature is also due to come in a future update, along with an integrated VPN. There’s no option for UPnP, which is good in one way, given that the technology is so insecure; however, it means that some devices may not work correctly, and will have to be manually configured using port forwarding. All updates are applied automatically to the router, reducing the traditional risk that the firmware goes out of date, leaving any flaws open to be exploited. There’s little point in additional security if performance isn’t up to scratch. Internally, the router is an 802.11ac model, with AC1750 speeds (4S0Mbit/s 24GHz and 1,300Mbit/s 5GHz). That makes this a mid-level router, and our speed tests showed this. At dose range on the 5GHz channel, the router managed 2T7.52Mbit/s upload speeds and 348.3Mbit/s download; moving one floor up, we saw 226.99Mbit/s up and 269.52Mbit/s down; on the second floor, speeds slowed to 59.99Mbit/s up and 205A8Mbit/s down. These throughputs aren’t bad, but put the router a way off the pace set by routers with faster Wi-Fi chips. are consistent, we’d expect to see results closer to 100Mbit/s from 2.4GHz networking. If it’s speed you’re looking for, the Linksys WRT3200ACM would be the best choice. Alternatively, the BT Whole Home Wi-Fi could be connected to the Sense: it offers greater speed at distance, and extended our Wi-Fi coverage into the entire garden. The only downside is that there’s no option to disable the Sense router’s Wi-Fi. 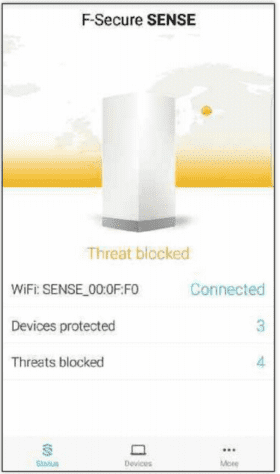 All that said, the F-Secure Sense is still an interesting product, genuinely improving the security of every device that’s connected to your home network. However, in its current state, there are a few too many omissions for us to recommend it to everyone: it needs the updates to add much-needed features, the Android app needs to provide the same configuration options as the iOS version, and it would be much better if the Sense could replace your old router. Updates are due to come, improving things, so you may be better waiting for these before buying.